View all vegan product reviews! Did you know McCormick Bac’n Bits are vegan?! No one is ever going to confuse McCormick Bacon Bits with “health” food, but what they lack in vital nutrients they make up for in taste. And they’re vegan! Smoky, crunchy, and salty, these fake-bacon bits taste great on baked and mashed potatoes, sprinkled over split-pea soup or corn chowder, tossed into salads, or as a tasty topping on your next slice of pizza. Some of us have even been known to eat them by the handful straight out of the container! 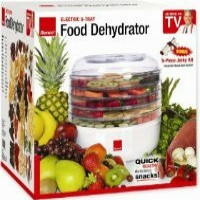 Look for them on the condiment aisle at your local supermarket, or online at Amazon.com. 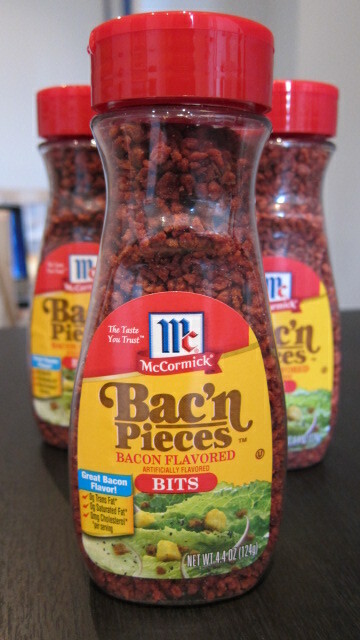 Actually, I sincerely don’t think McCormick Bac’n Bits qualify as being truly vegan. Lactic Acid is listed as one of their ingredients and Lactic acid is a Dairy Byproduct. This means that they are not purely vegetable based. Though it is true that Lactic Acid can be plant based the distinction is commonly listed as such unless it is the Dairy based substance. Although it can be fermented from lactose (milk sugar), most commercially used lactic acid is derived by using bacteria such as bacillus acidilacti, Lactobacillus delbueckii or Lactobacillus bulgaricus to ferment carbohydrates from non-dairy sources such as cornstarch, potatoes and molasses. Thus, although it is commonly known as “milk acid”, products claiming to be vegan sometimes feature lactic acid as an ingredient. That having been said, I just called McCormick and spoke with a very nice representative who explained that McCormick Bac’n Pieces are kosher pareve, meaning no eggs/meat/dairy products or byproducts are used in the manufacturing process. While food that is kosher pareve will not contain dairy products, mammal flesh, or bird flesh, it may contain bird eggs, fish eggs, or fish flesh, so be careful! That is great to know! Thanks. Actually, I just ordered a vegetable based Lactic Acid powder. I want to experiment with a more realistic tasting vegan Sour Cream… I noticed the more realistic tasting vegan sour creams contained the Lactic Acid instead of the usual vinegar and lemon juice.. I have been doing my homework, and learning. I take back what I said about them not being vegan.